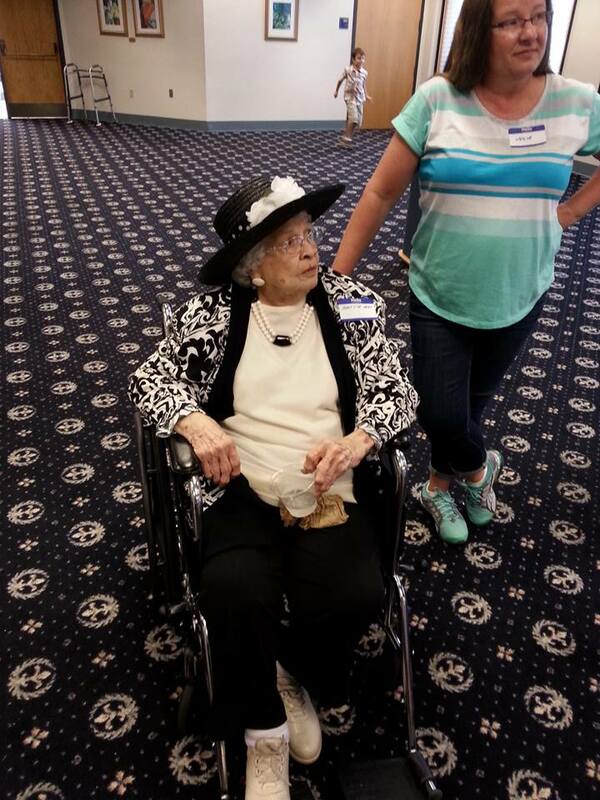 My Great-Grandma, Hattie, turns 90. If I could have imagined that my weekend would have found me so happy, I would not have believed it at first. I began by picking up my sons early and returning home to everybody getting cleaned up for a special evening out. With button ups shirts, khakis and dresses on, our family made its way to the local university for a special celebration. We were going to the university to help celebrate my Great-Grandmother’s 90th birthday. I have always admired my Great-Grandma, always a woman of class and modesty, always looks wonderful, and to still be living at home by herself, until now, is a tribute to a wonderful quality of life. To see her reach this milestone is one that I am grateful to be at and have my family there to be a part of it as well. Upon arriving at the university, we saw family that had come from all over, Michigan, Ohio, Indiana, Illinois, Minnesota and Vermont to celebrate. A diverse mixture for sure, see my family covers many areas of skills, many from the fields of engineering, auto manufacturing, design, literature, oil manufacturing, music and education were represented. It was wonderful to see family that I have not seen in several years and be taken back to a time that we would get together at least once a year. I also saw those who were very much children when I last saw them and now realize that they are now adults, on their way to chasing their own dreams. Marcey and I watched as our children ran around the open end of the banquet hall and used their imaginations to have fun. The kids were so excited to see their Great-Great-Grandma. Not many have that and for out children to be 6,7,7 & 11 for them to remember this evening is more than special. To see my Great-Grandma look so wonderful at 90 is beyond words, with her rings, necklaces, jacket and hat, she continues to have that style about herself that even father time can not take away. In a wheel chair only to be more comfortable than sitting in a stiff chair, she visited with everyone and seemed to shed some years as old memories came back and time stood still. It was a catered meal, very fancy. Our dinner was served in silver pans and platters. Ham, Chicken, mashed potatoes, corn, green beans, salads and rolls were served and I would be lying if I said our kids didn’t eat well. We drank out of fine glasses and had cake as stories ran rapid and a good time was had. We sang Happy Birthday and then listened as my Great-Grandma gave a great talk about family and how she was touched that the very best of the family were there and how happy she was to see them. I also connected with new Facebook friends in the form of cousins that are also writers and musicians. After three hours we all left the university, happy, full and fulfilled. Then today, my aunt from Vermont, cousin from Minnesota and grandma came over for a visit and brought pizza. It was nothing more than a continuation of the previous night as the kids got to spend time with their family and enjoy all the pizza they could eat. It was great to have family over and share in the stories and catch up on old times. My wife also got to show off some of her designs from Fox Notions (https://www.facebook.com/foxnotions) to great response and my first picture book was passed around, also to a great response! It has left us discussing Ideas and laying out plans to expand my wife’s operation with her ideas! I am so very proud of her! This weekend has also brought me back to The Boondock Kids and the difficulty I have had in developing the next scene after leaving Mrs. Nellinfelter’s. It will take place back at school but lead elsewhere. Tomorrow night will be interesting as I will sit down and work through it! I will let you know what happens! Until then, I wish you a very good week ahead and a wonderful Monday, filled with joy, happiness and success!